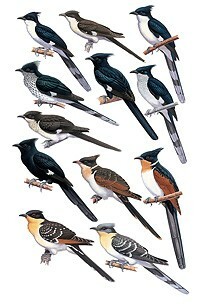 Cuckoos of the World by Johannes Erritzøe et al. The Common Cuckoo is very much oiseau du jour at the moment, with satellite-tracked individuals providing a unique glimpse into their migratory world. But it's not just this latest study that has brought the species close to the nation's heart; its distinctive song — the herald of spring and the essential backing track to a warm summer's evening — and its famed egg-laying habits have given the species a special place in tradition, folklore and clocks. What of the globe's other 143 species, though? Members of the Cuculidae family occur on all of the world's vegetated continents. Some, like the roadrunners of Central America, are as well known as Europe's Common Cuckoo; others, like the Moluccan Drongo-cuckoo of Wallacea and the couas of Madagascar, less so. Cuckoos of the World, the latest in the Helm Identification Guides series, covers them all. The introductory section gives a fascinating overview of this varied family, from systematics to conservation. The colour plates are magnificent, painted by four different artists but sitting side by side without any clash in styles. A single plate includes multiple illustrations for up to six species but it's largely clear which illustrations belong to which species, and the space is generally well used without feeling cluttered. The maps are clear and easy to understand, so long as you know which part of the world you're looking at — a map containing just an island group can be hard to put into context until you've read the text. Dotted lines denote subspecies limits, an extremely useful addition missing from a surprising number of other publications. The photography is stunning and it's an impressive statistic that close to 140 of the species featured in the book have at least one in-the-field photograph associated with the them; my personal favourites are the dazzling African Emerald Cuckoo featured in the introduction and the pastel-shaded Grey-capped Cuckoo on page 307. I have further reservations with this book, though perhaps less critical to the average user. "Great," I thought when the publication first arrived on my desk, "I'll be able to look up the latest moult information and ageing criteria for Common Cuckoo" — such are the priorities in my life. I was disappointed to find that the moult section for the species consisted of one sentence about timing of body moult. And, since the most widespread method for ageing Common Cuckoos relies on the assessment of retained secondaries (not mentioned under 'Moult'), it's perhaps not surprising that the only age classes covered under 'Description' are juvenile and 'adult'. Perhaps I'm being pedantic. After all, ageing Common Cuckoos is subtle at best; so how about a more obvious species, the Great Spotted Cuckoo? The species often shows a distinctive first-summer plumage — so much so that it's even illustrated in some general-purpose field guides. Sadly in Cuckoos there is not even so much as a hint that there might be a recognisable plumage between juvenile and 'full adult'. Ultimately, this book does shine brightly in many areas. 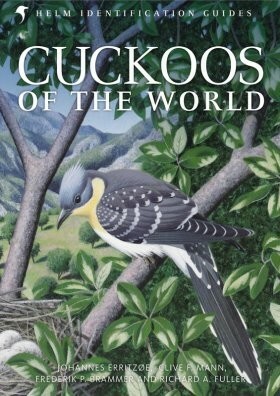 If you can overlook the absence of some of the more technical aspects of morphology — and the slightly hefty price tag — then the artwork, the photographs, the illuminating text on behaviour and nesting, and the overview of identification of all the world's cuckoos are likely to make this book an attractive addition to the Helm Identification Guides family.